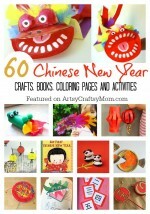 Celebrate the Year of the Pig with these pink and playful Pig Crafts for kids! Have fun making pigs out of paper, cereal boxes, toilet rolls, rocks and more! We’re well past January 1st, but you know what? The New Year celebrations aren’t over! How can they be, when the Chinese New Year is still in waiting? Yes, this is the year of the pig, and we pray it will be a good one too! 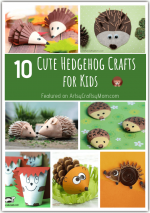 To celebrate the occasion, we’ve rounded up some of the cutest and pinkest pig crafts for kids from around the internet into a concise little list for you! Enjoy! We love making Origami animals, and this pig face from Red Ted Art is just the cutest! Make an entire family of Pappa Pig, Mamma Pig and little piglets – all out of nothing but pink paper! This craft from Doodle & Stitch furthers the ‘going green’ movement in two ways – one, it upcycles a plastic bottle into a planter and two, it improves the greenery around your home! Bonus: it looks adorable! Rock crafts are all the rage now, and if you find a flat one, be sure to make this little pig magnet from Martha Stewart! Use cement glue to make sure your magnet withstands the wear and tear of daily use. A paint chip pig? Apparently, paint chips aren’t just for Christmas crafts – they’re perfect to make a pig too! Making of a Mom uses various shades of pink paint chips along with the regular stuff to create a unique little pig! If your family has cereal regularly, you’re bound to have many empty boxes. Don’t throw them away; instead, make your own set of farm animals, including this cute cereal box pig from I Heart Arts and Crafts! Got an old CD and some pink felt? Then you’re all set to make this P for Pig CD Craft! Goes great with animal lessons or simply for a Peppa pig fan! This clay pot pig from Craft Ideas Info is so cute and perfect for spring. Just make sure you get a styrofoam ball that fits the size of your pot so it looks proportional. Great garden decor for Valentine’s too! Want a cute little friend to help you keep track of your reading? This pig corner bookmark from Easy Peasy and Fun should help! These are super easy to make and you can make several in one go. Have fun with your very own pig puppet, made using a paper bag! If you can find a pink paper bag this craft becomes insanely easy, or else you could just paint. Get the instructions at Violet Paper Designs. Pigs aren’t usually associated with the word ‘fluffy’, but this craft from Craft Ideas Info will change your mind! 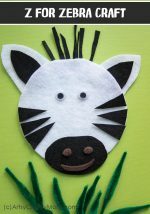 This is a very easy craft with basic craft supplies, and preschoolers can do it easily with some adult supervision. Look We’re Learning has a super-easy, super-simple crafts to keep the kids occupied when they’re getting antsy indoors. All you need is – a coffee filter! This craft includes a little bit of coloring and a little bit of sticking making it great for beginner crafters. A wooden spoon into a pig? Yes, it’s possible! Easy Peasy and Fun shows us how easy peasy this is, with a wooden spoon, pink pipe cleaner and a pink button that makes an adorable nose for the piggy! Look at this cheery little piggy – doesn’t she make you want to smile? That’s the magic of crafting! Plaid Online has all the instructions you need to make this adorable little paper plate pig. Got tissue boxes lying empty after a bout of the sniffles? Use them to make a cute tissue box piggy bank, as shown in Parents. 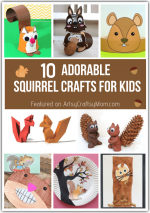 Everything you need is probably lying around the house, making this a truly recycled craft! We’re huge fans of paper crafts – they’re easy for young kids to manage and you just need some glue to put it all together! That’s why we love this 3 D Paper pig from Twitchetts – simple and perfect for the Chinese New Year! Isn’t it nice to watch a windsock flying with abandon as the breeze rushes through? Enjoy this feeling with a DIY pig windsock, as made by Buggy and Buddy. 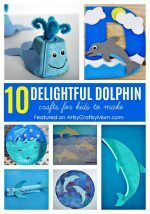 It’s amazing what you can make with construction paper! Want to add some piggies to your play farm? Well, these sponge roller piggies from Smart School House are probably the easiest way to get them! Adding googly eyes gives these pigs a whole lot of character, and you can have boy and girl versions too. What’s pink, lacy and sweet? A pig valentine!! This paper doily pig from Glued to My Crafts is the perfect Valentine craft to make as the Year of the Pig begins. We also love the sweet little piggy nose! The story of the three little pigs is one that never gets old, and there are also some hilarious new versions! Skip to My Lou has a simple puppet craft using toilet paper tubes where you can make three little pigs with three completely different expressions. There couldn’t be a better way to celebrate the start of the Year of the Pig than with a Pig Fortune Teller! Red Ted Art has the full tutorial on how to make an easy pig cootie catcher, with which you can impress your friends! Did you think you could make pigs out of so many things? 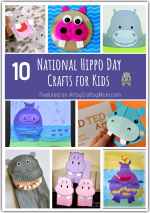 Most of these pig crafts for kids are really easy, making use of just a handful of supplies. So this Chinese New Year, let all kids – big and little, and even the kids-at-heart get together and celebrate with some pigs for good luck!